I had a fabulous weekend in Huntington, WV. Beautiful fall weather, and so many readers at the Rebels n Readers Event! Wow!!! Thank you so much to Amy McGlone and Tonya Nagle for organizing this. Normally, I like to squirrel away in my house writing, snuggling the hubs, basically – I’m a homebody. BUT – I convinced myself to get out there and go to the mixer on Friday. I’m SO GLAD I DID! I met Devon – an amazing woman, in my opinion – who tried to read one book from EVERY author at the event. That’s total dedication and she rocks as a person!!! She made my night because she REMEMBERED MY NAME! Now, if you know me, you know that I find that to be an extraordinary feat. I can’t even remember my kids names half the time;) Not only that, but she liked my Her Lucky Number and my sense of humor. Pretty much never gonna forget that moment! Becca and I also met Caylan Hughes at Marshall Cafe. You can find pictures of the beautiful ginger here: https://www.facebook.com/caylanhughes1/ Also, a super sweet guy! Not that I’d expect a model to be cranky – even if they forego french fries for the gym, but Becca and I were looking up the models names pre-party while sitting at the bar because I was looking for a blonde Alexei. I pulled up Caylan’s picture, and yeah, he’s standing next to me waiting for his to-go order. Me: “He’s a cute ginger, I wish Hannah was here. But I need a blonde.” Awkward? Yeah… for those of you with filters. Becca’s my filter and she couldn’t edit me fast enough. BTW – yes, he really does have very broad shoulders, and a southern accent. We chatted for a few minutes, because hello – he IS a beautiful ginger, and he’s in Huntington – where Becca grew up – and well, we were being friendly. At the party, Becca and I tried to introduce ourselves to EVERY person there. (Okay, admittedly it was all me, because Becca is slightly introverted.) We met Ty Halligan – you can follow him on instagram here: https://www.instagram.com/ty_halligan/ He’s SO CUTE! 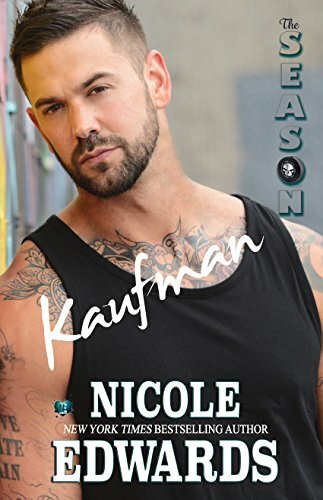 Seriously, he’s affable and adorable, and totally the boy next door – in a neighborhood where every boy is extremely attractive, muscled, and rocks tattoos. 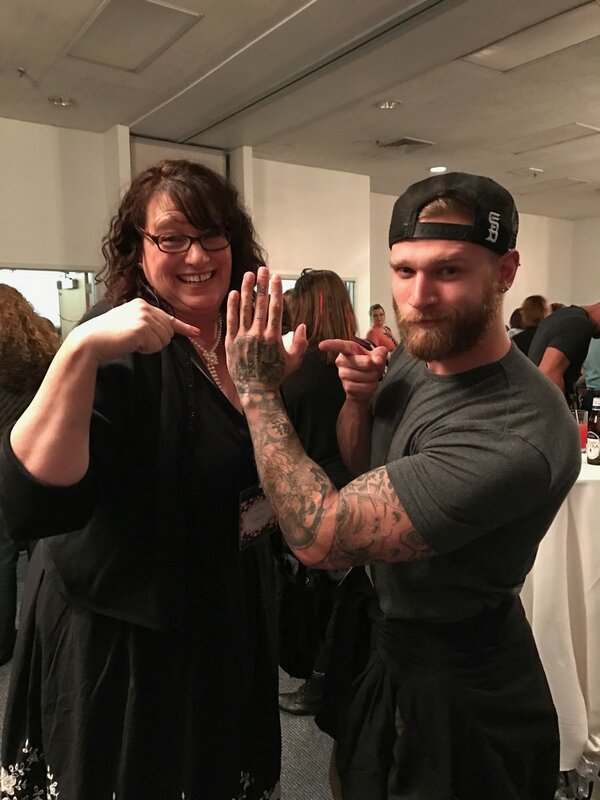 If you’ve never been to a romance readers author event, I recommend them highly. Becca and I are looking forward to next year, and maybe even traveling t0 a couple. 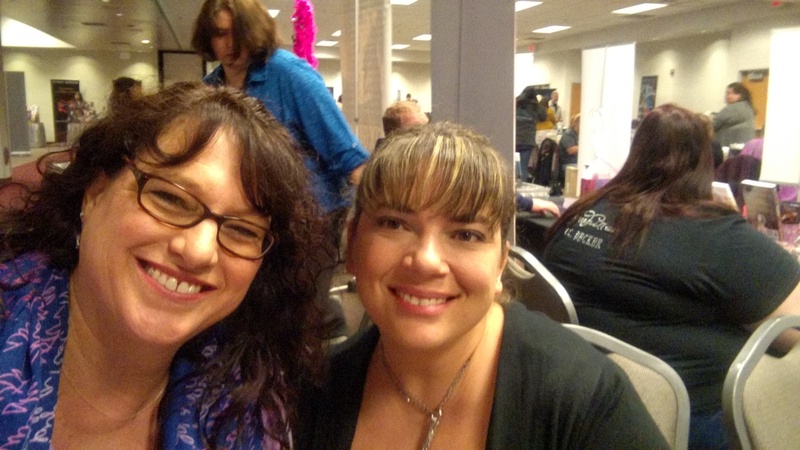 Becca and I really loved meeting every one – and I may have fan-girled a little while sitting across from Nicole Edwards, but can you blame me? She had her cover model with her signing books and calendars. People are so very creative – not just the authors – I mean I was totally blown away with the mementos people made and had all the authors sign. It was crazy cool. We had a great weekend, and loved meeting everyone. Thanks to everyone who showed up, you made my year.